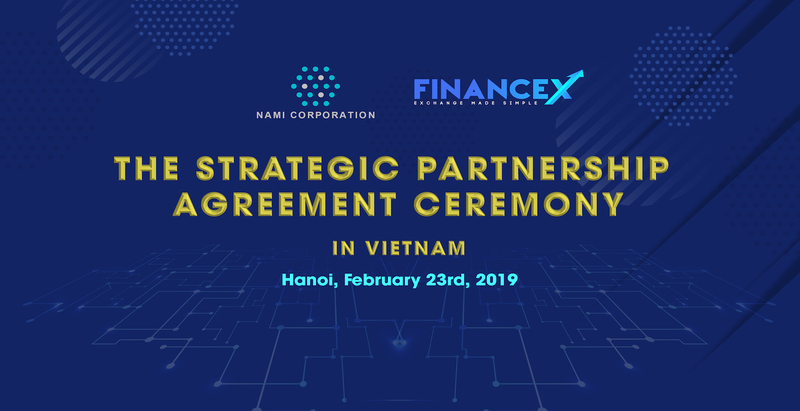 On 23th February 2019, the MOU signing ceremony between Nami and FinanceX, is held solemnly at VPBank Tower, Hanoi. The MoU is an important step in mutual understanding and cooperation between two parties in the area of blockchain technology and finance. FinanceX is a world-class digital asset exchange that provides the ability to trade in local currencies (fiat). FinanceX is moving toward providing convenient, reliable and secure services which help customers buy and sell digital assets in real time. Traders can buy, sell and manage digital assets in fiat without any constraints or any risk of exchange rates. Established by a team of fin-tech experts, and backed by financial institutions from Japan, Singapore, and US, FinanceX inherits years of experiences in development, operation, and management of forex and stock exchanges. FinanceX provides customers with the most secure, reliable and real-time platform for trading. Working in the same sector, Nami Corp. is a global FinTech Corporation focusing on Investment and Technology based on Blockchain. It’s not just a single platform, we have created the whole Ecosystem to help Contributors and Traders around the world to utilize their experience and their money with the slogan “Change mindset, make giant steps”. At the end of 2018, Nami had launched new product called BitBattle.io – a P2P trading contest platform, after having brought nami.trade – a decentralized broker into life. On BitBattle, users spend SPIN to predict the price of crypto and win rewards like BTC, ETH, other Altcoins in return. Sharing the same background in blockchain, we believe that this corporation will bring us mutual benefits in technology and market development. The ceremony took place in Nami Hanoi Office with the presence of Nami CEO – Giap Van Dai and FinanceX Vice Chairman – Chien Tran. Nami Corp. is a global FinTech Corporation working on Investment and Technology based on Blockchain. It’s not just a single platform, we have created the whole Ecosystem to help Contributors and Traders around the world to utilize their experience and their money with the slogan “Change mindset, make giant steps”.